No Chinese meal is complete without fried rice or steamed rice.Sweet Corn and Mushroom Fried Rice is a delectable blend of spicy flavors that are sure to tease our palate. This is a very tasty and healthy stir fried rice with sweet corn and mushrooms. 1.Set the rice to cook with rice:water in 1:1.5 ratio. Ensure you add about 1/2 tsp of salt to the water before you place in the cooker. Cook the rice in rice-cooker .to get perfect, non-sticky and separate grains of rice once done. You could even use your normal, everyday rice. 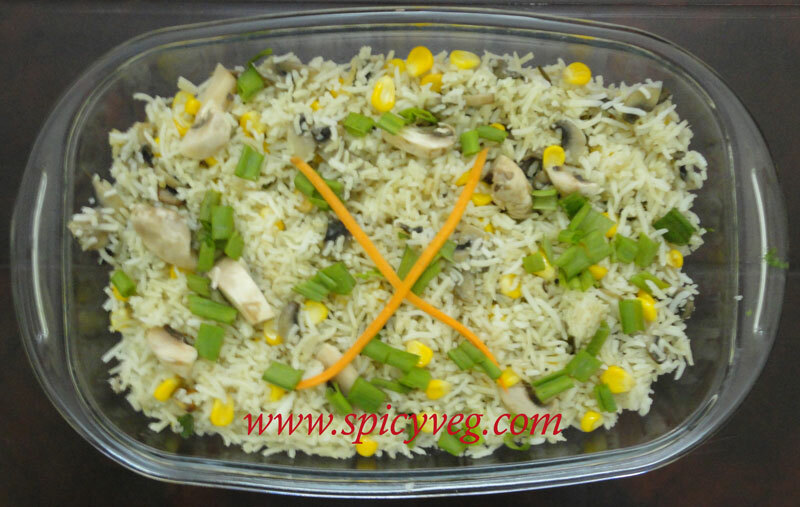 2.Once the rice is done, gently spread on a wide plate and let it cool. 3.Clean the mushrooms and cut in to quarters and set a side. 4.Now, heat oil in a wok. Add the finely chopped spring onion whites, ginger and garlic .Saute on a medium flame till the onions are cooked and tender. 5.Add the spring onion greens and saute another 2 minutes till they wilt. 6.Next, throw in the sliced mushrooms and sweet corn continue to saute till it is cooked. The water content in the mushrooms is sufficient to cook the mushrooms, so don’t add any additional water. 7.Add adequate salt (don’t forget the rice has salt added too). Stir well. 8.Add the Ajinomoto ( if using), stir well . 9.Simmer the flame and add the soy-sauce and chilli sauce . Ensure you simmer before you add the soy-sauce, else you’ll end up with a funny, burnt taste in the fried rice…. Stir well. 10. Use a long spatula and gently flatten out any lumps in the rice. Add the rice to the wok , stir well to incorporate and cook on a high flame for 3-5 minutes, stirring continuously. 11.Remove from flame, garnish with more chopped spring onions, and serve hot with any other Chinese gravy of choice,or simply with tomato sauce.